New to launch in the Ritual Hockey stick range for 2018 are the super new ‘Ultra’ hockey sticks. Available as always from Ritual in a range of carbon content configurations, the Ultra hockey stick is an extreme low bow hockey stick with an interesting new head profile for ultimate 3D skills control. When you review the Ritual Ultra hockey stick as an extreme low bow option you won’t be surprised to see that the bow position is as low as available from any brand in 2018. Just 200mm up from the head, this very distinct bow on the Ritual Ultra is seriously low. Standard reasons for going with such a low bow include trapping incoming balls nicely with the hockey stick seemingly wrapping over the top of the ball to stop it spinning up then stick. Ritual major on another key technique by making the Ritual Ultra hockey stick particularly focused on 3D skill work, lifting the ball to us old people. 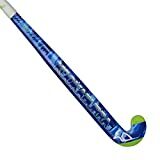 In addition to the bow position on the Ritual Ultra hockey stick, for 2018 the head has been made thinner towards to bottom of the head, making it even easier to scoop up the ball, particularly in little chink situations when dribbling. I think this is a great feature for the 2018 Ritual Ultra hockey stick, however it makes the head less forgiving if you strike a miss hit slog off the bottom of the head. So either make sure you are accurate! Where ever the bow position is on the Ultra, buying a hockey stick from Ritual you can be assured of Ultra good quality. I’ve had the pleasure to review quite a few Ritual sticks over the years and the 2018 Ultra contains the key elements which do make Ritual damn good hockey sticks. Great quality materials make the feel on the ball crisp and hits powerful. Really well thought out balance points make for a fantastic combination of swing speed and dribbling control. Literally one of the best anti-shock (aka no painful hands in the frost) technology. Also Ultra slick designs. The 2018 Ritual Ultra looks amazing with its matte black effect subtly detailed with gold and silver. The Ritual Ultra hockey stick is really classy looking, as well as effective on the pitch. Who is the Ritual Ultra hockey stick for? Because of the focus on the new head and the bow position, this Ritual Ultra stick is going to suit a fast, creative dribbler of the hockey ball. I would say you want to be confident in your ability to go round players and looking to take that to the next level. While brilliant for dribbling, don’t forget the head of the Ritual Ultra doesn’t offer a lot of forgiveness on hits. So if you game requires you to slog the ball often, perhaps not the best for you. There are 3 different material composition options in 2018 for the Ritual Ultra hockey stick. Everything else is the same.